Joanna and Galley at Kelso Dunes. A couple of years ago, I relocated from New Jersey to California for work. 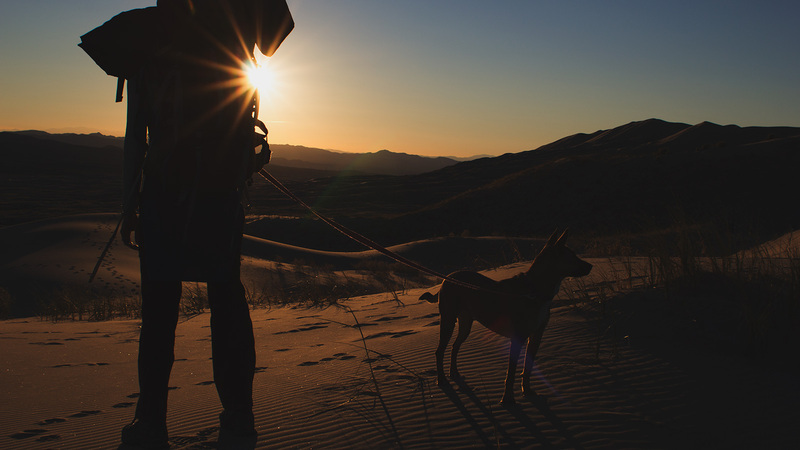 Partly because we were reluctant to fly our dog commercial, and partly because road trips are our thing, we decided to pile everything into a rental car and overland it. Time was limited, so we made haste across the eastern half of the continent and only slowed down to really look around after we got to the Rockies. 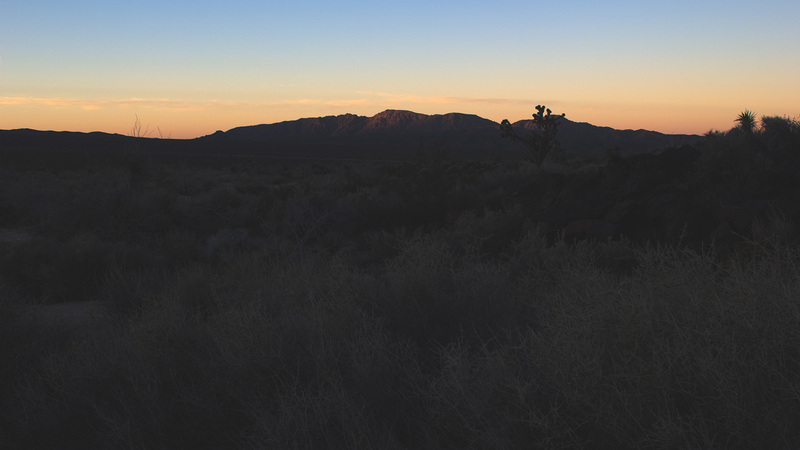 Our last relaxation stop was two nights camping in Mojave National Preserve. Kelbaker Road north of Interstate 40 takes you between the Granite and Providence mountains, and then eventually to Kelso-Dunes Road, a worn dirt thing that strikes out west into the sand. 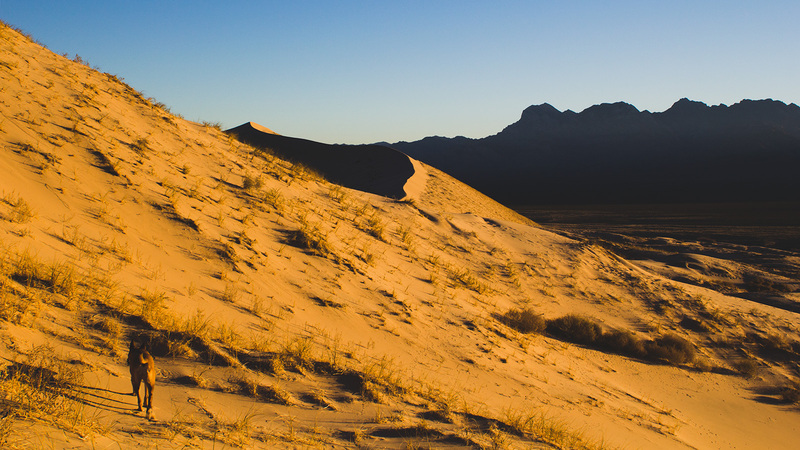 After about four miles on this, there's a parking area that marks the trailhead for the Kelso Dunes Trail. 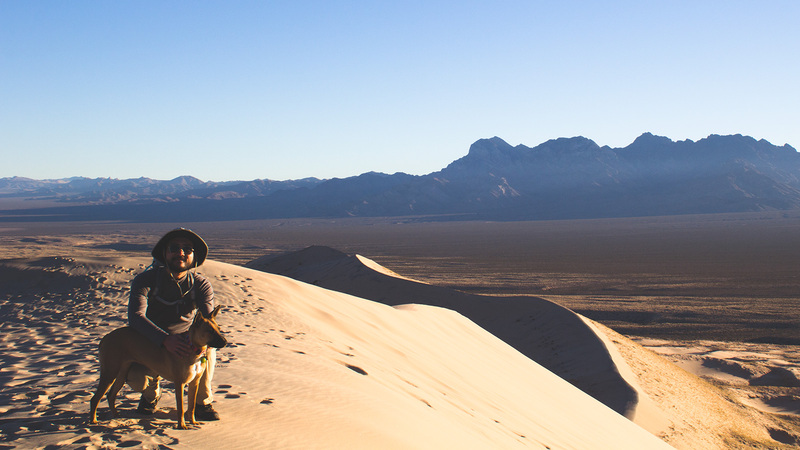 You'll likely see footprints from the trailhead leading north towards the sand dunes, which rise several hundred feet above the desert floor. Don't get too attached to the idea of a trail though. The sand shifts constantly and footprints are a very temporary thing in the desert. As you move away from the trailhead, the evidence of those before you fades and even your own tracks behind you may erase as you go. The dunes however, will be a prominent landmark to the north, and you know you can always head south to get back to the road, so these cues offer some confidence while making your own way across the sand. We arrived at the trailhead late on a winter afternoon, so only had an hour or two of daylight left before we had to make camp. Camping regulations are not very restrictive. 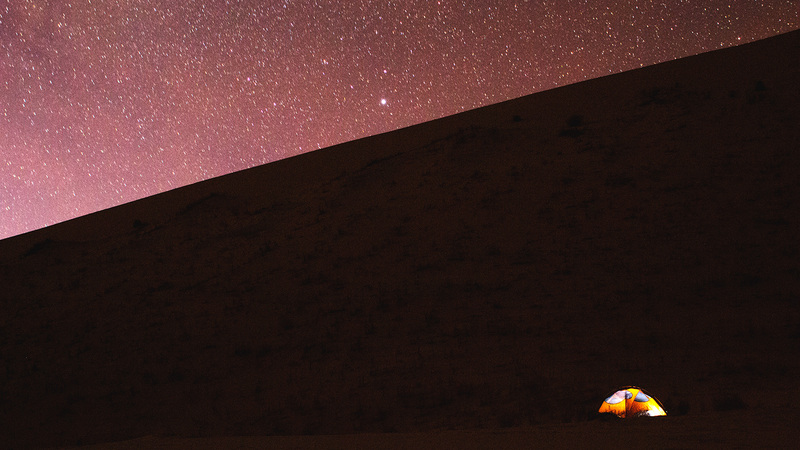 There's no permit system and dispersed camping is allowed north of the dune crests at Kelso Dunes. With no designated campsite, we simply kept an eye on the low sun and hiked until there was just enough daylight left to set up camp and make dinner, then found a nice spot to call home for the night. The next morning, we couldn't resist climbing the dunes first thing. There's a reason playgrounds have sandboxes. Sand, after all, is a fluid you can walk on, climb on, and jump into. It dances across itself in the wind. You can draw in it and build with it. Adult-sized humans are attracted to adult-sized sandboxes, and when we woke up at the base of hundreds of vertical feet of sand, there was really only one thing to do — play. But the dunes were hard climbing. For every two steps, the sand would slide us back one. Galley, our dog, had far superior traction with four paws on the ground, and made no effort to hide it, running ahead of us up the slope, then back down for a couple orbits around us, then back up the slope again, waiting for us to catch up. We trudged along behind her, glad we were hiking in winter and not in the summer heat. Soon, we made it to the dune crest and had a seat. We took in the view along with a mid-morning snack. Galley and me on the crest. If the background looks like something out of a Star Wars film, it's because some Tatooine scenes were filmed in the Mojave. Of course, after the hard work of climbing, there was only one way to get back down: to roll. We saw some people the previous day carrying saucer sleds, which is also acceptable transport down the dunes, but purists don't need sleds (or don't think ahead enough to bring them). If you do choose to roll, two notes on rolling several hundred feet down a giant sand dune: you will get sand in everything — shoes, nose, ears, everything — and it will take several days to stop having sand fall out of you. Second, plan beforehand a flat area where you would like to stop and aim for that. Once you get going it might be difficult or dangerous to stop yourself with your arms. After rolling and being thoroughly imbued with desert, we had breakfast and broke camp. We hiked back to the car and drove to our second stop in the park, the cinder cones and lava flows in the north. The contrast in landscape was amazing. We'd left the soft flowing sand of the dunes and had entered a world of dark volcanic rock and frozen lava paths. A forest of Joshua trees, the largest and densest in the world of these crazy trees, populated this alien place. I felt like we were on Mars, and Dr. Seuss had preceded us. Cactus in front of Cima Dome. The lava fields were punctuated by cinder cones, tiny mountains of volcanic rock formed by non-explosive eruptions, where lava flowed more or less gently out of the earth, like volcanoes with self-control. 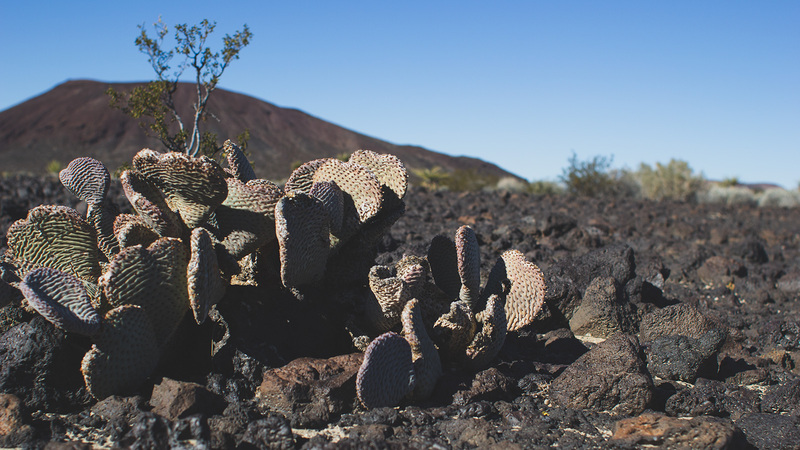 The cinder cones of the Mojave are great representatives of the landform because they're so well-preserved, and are fairly young, with some having been active during the last ice age. One of the largest cones is Cima Dome, which rises 1500 ft above the floor, covers seventy square miles, and is the most symmetric dome in the country, if you're the type excited by symmetry. We set up camp just beyond the reach of the lava and started towards the dome. This time, we had the advantage over Galley because the trail was so steep, and the ground so loose, that she had trouble keeping her footing on the way up. I eventually made the call to stop and stay with her about two-thirds of the way up while Joanna completed the summit, as Galley was clearly trying to tell us she was uncomfortable and wanted to turn around. Joanna said the view on top was lovely. To Galley's relief, we headed back down and she started napping on the trail as soon it flattened out, the poor exhausted dog. I too, felt laying down was not a bad idea, and was glad to find our tent where we left it. It was then dinner and bed, goodbye to the desert, and on to the Bay Area the next day.